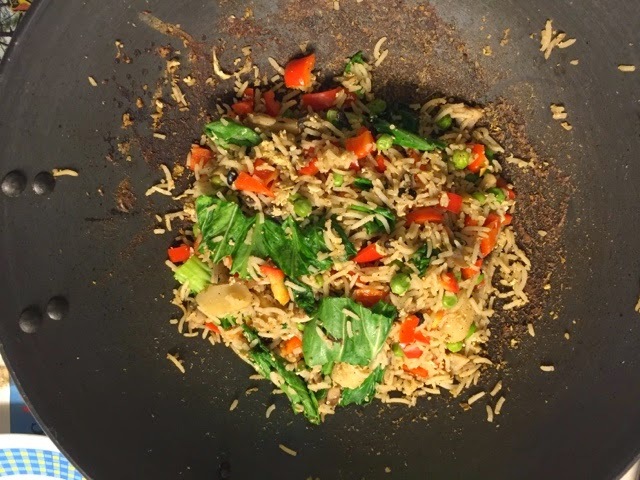 The advantage of fried rice over Hakka noodles is you use a lot less oil this way. If you keep your veggies chopped from before then this could be quite a kick dish to rustle up. A few little suggestions. I would suggest that you add the (cold) rice after the mushrooms but not before the sauce or before the eggs. This prevents the brown sticky bits forming that I see on the pan, keeps the rice from getting too soggy and allows the rice to brown first from the heat of the pan rather than browning due to the soy. After the rice has browned and has a good flavour on its own, the egg can be added. Also would suggest cooking with normal vegetable oil first and then seasoning with sesame towards the end. Reason being fried rice needs high heat to get the smoky charred (but not burnt or sticky) flavour. 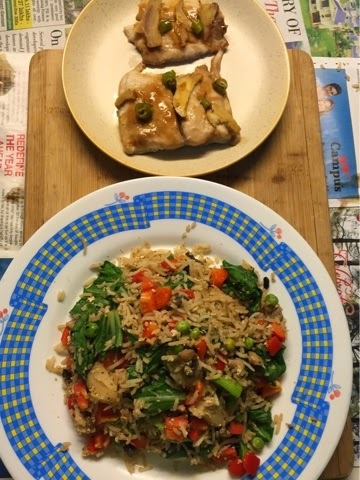 Apologies for the long comment but I just absolutely love fried rice and am just nitpicking the little details because I cant resist - I think it can be an exceptional dish if done in a certain way. Yumm and am definitely going to try this quick recipe.